I ran the Om Die Dam half marathon today in Haartebeespoort. Sam and I finished the race in 2:24:05 according to my watch (the official time is slower because they started the time when the gun went off and not when we passed the starter mat). I missed my personal best time by 30 seconds!! 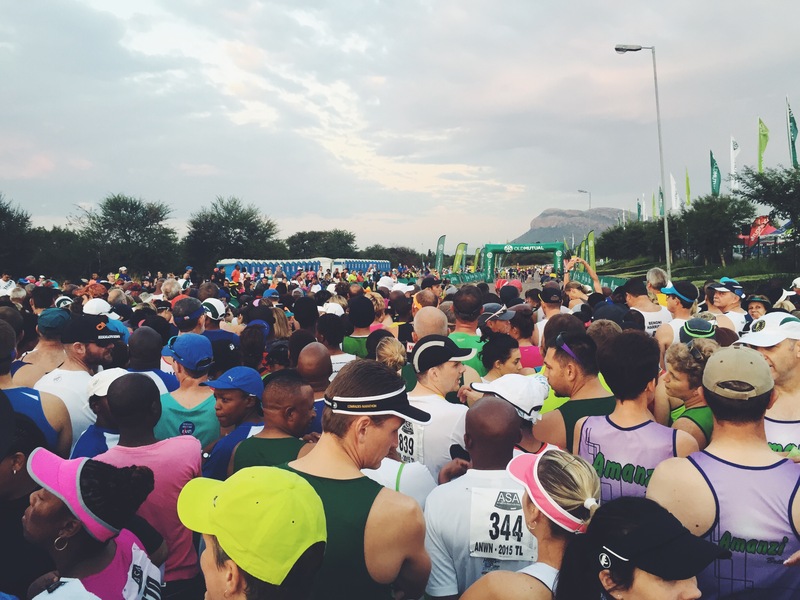 However, considering I wasn’t planning a PB race today, I’m not cut up about it… I was hoping to do 2h30 or even slower because it’s my last long run before Two Oceans and I didn’t want to kill myself. Just checked on Strava, and this race was a personal best! Whoop! 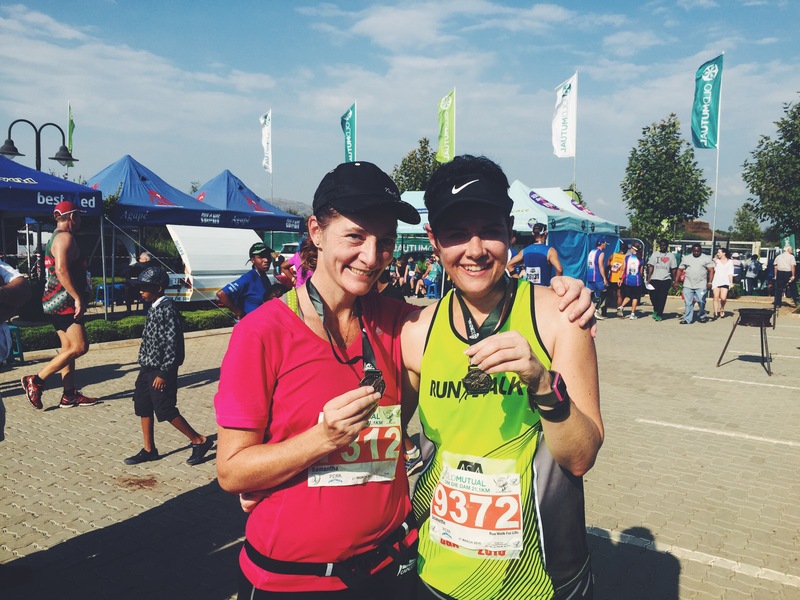 I beat my previous PB at the Soweto Half by 2 minutes! Wow! I’m actually over the moon. I wasn’t trying for a PB at all. I’m blogging about it before my body forgets the pain it’s in. LOL! These are my thoughts after spending most of the rest of the day sleeping and hobbling. Every muscle aches at the moment, and I have the most awesome blisters on my feet… in fact Sam took a photo of the one blister because it was red and in the shape of a heart. I cannot imagine running further. I actually had tears watching and cheering on the guy that won the 50km race (he finished 15 minutes after we finished the 21). I cannot fathom running 50km. My body is absolutely finished. Every muscle aches. Future Life shake in strawberry is actually not that bad, and travels well. I didn’t have the normal bubbles in my tummy for the first 10km, so it clearly worked. The last 2kms seemed endless. I had completely lost my mojo by then. I better get over this before the Two Oceans! I’m stronger on hills than I’ve ever been before. I’m going to miss my friend Sam when I run the Two Oceans in 2 weeks time. We run races so well together, I push her on the hills and she pushes me on the flats. It’s going to be a long and quiet race. Loved running in the new RWFL kit, it’s so much nicer than the old yellow kit… pity it’s going to change to the orange Team Vitality kit. The slip slops I packed in my bag were the BEST idea ever after the race! I really needed to get my shoes off. I must remember to pack plasters for the next race though, in case I get more blisters, I had to find a medical tent today. The traffic was a disaster. In fact, this may be the reason I won’t do it again. Loads of people were late for the race as a result. We left home at 3:30am, and only parked in Haarties at 5:30!! The route was hard. The first 5km were uphill, and then it was flat for ages. I’m not sure now whether I prefer a hilly or flat route, because you can recover on a downhill on a hilly route. There’s no resting on a flat route. The route markings were fabulous, better than the other races I’ve done. Every water point was well manned and stocked. There was one water point that didn’t have bins for the used water bags… I pity those people having to clean up. I took a lot more water than I usually take because it was so damn hot. The milk tart tartlets handed out at the 15km water point were amazing… I really needed something solid in my tummy for energy. 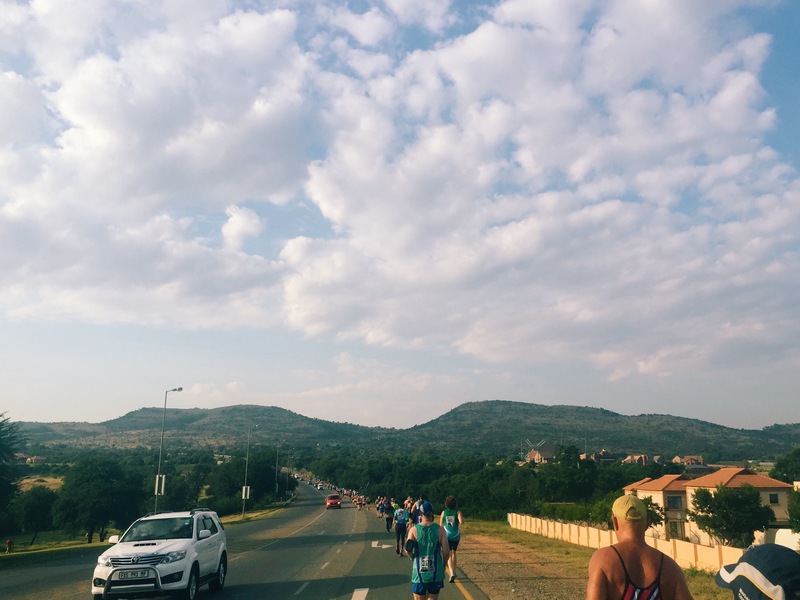 This was after 12km, and the only stretch of the race on a major road, but I did like the view of the hills. Sam and I at the finish 🙂 Look at those big smiles! I might give it a final bash next year, just to get a proper time. But if I skip it, it’ll be because of the traffic. The way you described everything is exactly what my thoughts were. Fortunately no blisters, but yes, with 2km’s to go, I also lost interest. The water points were manned well. I must say…the hills we experienced at the beginning are usually the ones we end on. Was kinda glad to get that over with. Traffic getting there was an absolute nightmare. Left Harties at 4h30 to be at the start on time. Considering I didn’t have to travel from Jhb, we would make it in good time!? NOT!!! I had to be dropped 2km away. Ran to the start, but was still 9 mins late. I proved something to myself again….you start out fast…you get yourself tired before half way. I ran like a mad woman to play catch up…not the best thing to do. Anyway, well done to you despite your very sore looking blister. 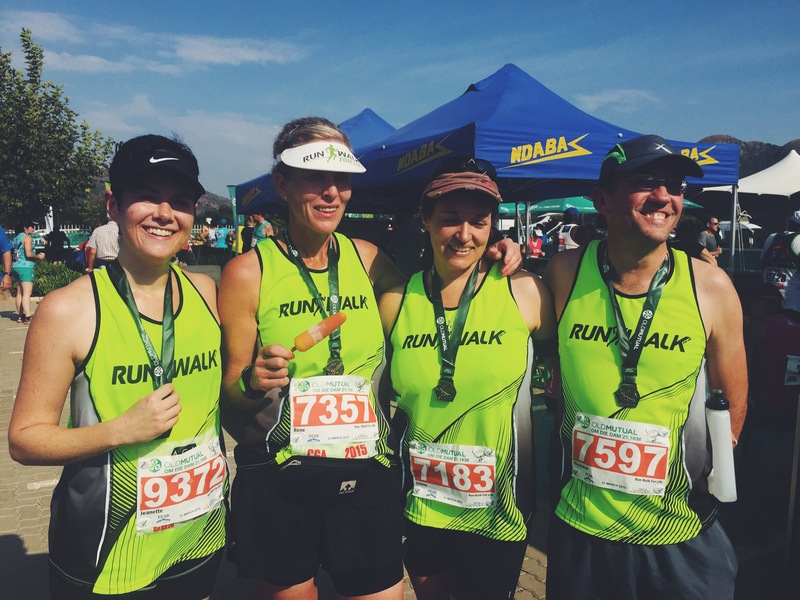 Congrats to Sam too:-) Two Oceans…just around the corner….have an awesome run!